Q: Which system is better for my home, open loop or closed loop? A: That depends on a number of factors… your budget, the availability of an adequate water supply and discharge, yard space, and primarily your own preference. Q: How does the cost of operating an open loop system compare with a closed loop system? A: An open loop system has an average water temperature of 52 degrees and uses the water well pump to deliver the water to the unit. A closed loop system averages 40 degrees in the winter, 70 degrees in the summer, and uses a small dedicated circulating pump. Factoring in these minor differences, the cost of operation is nearly the same. Q: Why might I prefer an open loop system? A: Open loop systems typically have a lower installation cost than a closed loop system, at least if your home has (or will have) a 4- or 5-inch well casing. The well can serve as your geothermal “source” with only a few modifications. Q: What modifications would an open loop system require? A: In addition to the 4- or 5-inch well casing for adequate household and system capacity, you may need a larger well expansion tank if you utilize a standard well pump. Many homeowners are selecting “Constant Pressure” well systems with variable speed pump motors and small expansion tanks. 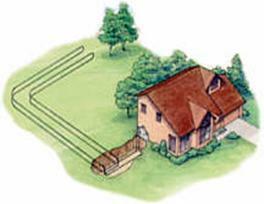 Q: Where can I best dispose of the water from my geothermal system? 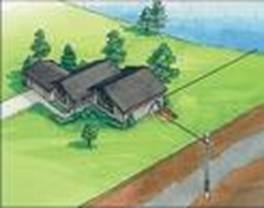 A: A gravity-type drain to a field tile, creek, or pond provides the simplest and most reliable discharge. Recharge wells have proven to be expensive, both to install and to maintain. Q: Should I be concerned about the hardness of my water? A: Usually not. Minerals in well water stay in suspension, except in the presence of air or heat. With the use of a bladder-type expansion tank and by keeping the water inside the unit under pressure, no air is allowed into the system. Most geothermal systems installed 8 and 10 years ago have not yet needed to have the heat exchanger cleaned. Q: How much water will my system use? A: Typically, today’s high efficiency geothermal systems use 1.5 – 2 gallons per minute per ton of capacity; or 5 - 8 gallons per minute whenever the unit is running. That’s about a garden hose stream of water. Q: Isn’t that a lot of water to pull out of my well in a year? A: The amount of water used annually averages from 600,000 to 800,000 gallons of water. Because of the large amounts of water available in most of Northern Indiana, Southern Michigan, and Northwest Ohio, this amount is generally available with no problem. The water will re-enter the hydrological cycle after several months. Compared to the burning of fossil fuels which are not renewable, even open loop systems are ecologically more sound than the use of propane or fuel oil. Q: Wouldn’t a closed loop system be better since it doesn’t “use” well water? A: Many customers select a closed loop system for that reason. Once the loop is installed, it’s filled once with 60-80 gallons of water and antifreeze solution, which will be re-circulated whenever the home needs heating or cooling. A closed loop system also eliminates “wear and tear” on the mechanical parts of your water well system. Q: Doesn’t the loop require a large tract of land? A: No. 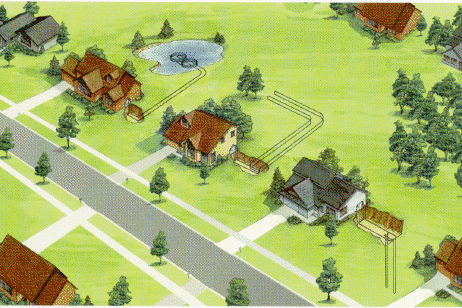 Most earth-coupled loops installed horizontally can be installed even on lots in subdivisions. Earth-coupled loops average 300 to 500 feet in length, with a width of two feet. 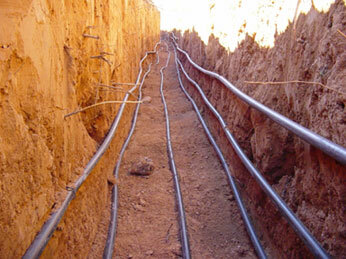 Q: How is the piping in an earth-coupled loop installed? A: The most common method uses a backhoe which opens a trench 2 feet wide and 6 feet deep. Three polyethylene plastic pipes are placed into the bottom of the trench. A layer of soil is backfilled over the pipes and a second layer of three pipes is placed in the same trench, bringing the total to 6 pipes in each foot of trench. Q: Is any special soil needed for backfill? A: The clay soil found throughout our region is ideal for loops… it holds moisture well and is the very conductive, making it one of the best soil types possible. Q: How is the length of the loop determined? A: Once the heating and cooling needs of a home are determined, computer software allows us to computer-model various lengths to determine optimum cost effectiveness. Generally, 100 to 120 feet of trench per ton of capacity is required. Q: How much does the loop installation generally cost? A: Installed loops average about $800.00 per ton of capacity for a horizontal closed loop, or $2400.00 to $3200.00 for an average home. A vertical closed loop averages $1500.00 per ton of capacity and is generally used where land space is very limited. Q: Can I use my pond for a closed loop system? A: Ponds with at least 6-feet of water make an excellent closed loop choice. A pre-assembled heat exchanger made of polyethylene plastic pipe is floated onto the surface of the pond, connected with a supply and return line, filled with a water and anti-freeze solution and submerged. Q: How does a pond-coupled loop compare with an earth-coupled loop? 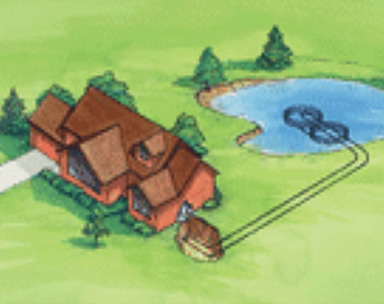 A: Operating temperatures and efficiencies are very similar, and the pond system can offer a slightly lower installation cost if the pond is located near the home. Q: Should I worry about a loop leaking? A: Not if your system is installed by an experienced and certified loop contractor. All joints will be “heat fused” and will never leak. Piping materials have a 55 year warranty, and the loop has a life expectancy of over 100 years.